Last week, Metro Nashville Public Schools (MNPS) Director of Schools Dr. Shawn Joseph announced that the district was preparing to undergo a realignment that would change how the central office supervises the district. According to Joseph, the move will create four zones, each with its own community superintendent, overseeing numerous school clusters, or groups of schools. In talking to people about this, their initial assumptions were that the clusters would fall into north, south, east, and west zones. But that’s not quite how things worked out. Hillsboro, Hillwood, and Overton will be one cluster. Antioch, Cane Ridge, and Glencliff will be another. Pearl-Cohn, Hunters Lane, and Whites Creek will be grouped together. As will be McGavock, Maplewood, and Stratford. 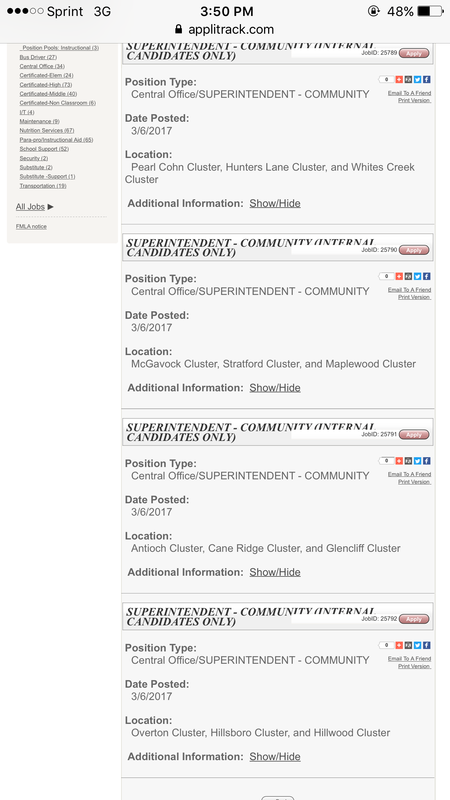 If you never saw the official announcement from MNPS, despair not; it’s only been released through MNPS’s job postings. Let’s take a deeper look at what this change could mean for Nashville’s schools. National readers you’ll want to follow along and I’ll explain why at the end. Before we go any further, I want to go on record as stating that this is an awfully big change to be announced in such a haphazard manner with very little public input or discussion. This is not just a “leadership change” but rather a large-scale district realignment that could have serious repercussions for the district if it doesn’t work. All we have to do is go back ten years for evidence of how serious the repercussions could be. Nashville operated under a similar structure during Dr. Pedro Garcia’s tenure as Director of Schools. But then MNPS changed to the current system after the state took over the district in 2008 due to low performance. Currently we have three Executive Officers who oversee all the schools in each separate tier: high school, middle school, and elementary school. That means we have an expert at every tier, which is important because the needs of each tier are so disparate. To be fair, some would argue that the previous system under Garcia was not a major contributor to the need for corrective action by the state. Low performance was more a result of No Child Left Behind being enacted, which changed the way things were measured. It was also at this time MNPS first saw an explosion of immigrant students, so that presented more new challenges. I’m sure that these events contributed, but we still have to look at the structure that was in place at the time of the takeover, recognize that the state changed it early in the takeover process, and from that, we can see that the new alignment – again, which is what we currently have now – contributed to us getting out of corrective action. Part of the conversation on this realignment should be an explanation of why we are undertaking it in the first place. According to Joseph, “Having one person for the parent to be able to contact from K-12 will help strengthen communication over a student’s career. The realignment will increase equity and access to supports. The community superintendents will know the schools, the programs, and be able to better align supports and resources.” The reasoning here, to be honest, baffles me. First, are we to assume that the new Community Superintendents will be remaining in their positions for the remainder of their careers? That’s a stretch. At the very least, if the superintendent were high quality, I would think they would eventually move on to a job as director of schools somewhere. I mean, it is unrealistic to assume that anyone in this type of position would be there for the duration my children’s school years. We’re talking over 12 years. So I’m not sure why this is a selling point of the new realignment. Secondly, MNPS is a district plagued by high mobility. The odds are definitely stacked against the majority of our kids completing their K-12 education in the same cluster. Add the fact that MNPS is already a district that practices a school choice policy, which, in essence, condones high mobility, and the reasoning Joseph used to justify this realignment just doesn’t add up. It’s my opinion as an MNPS parent that having an expert at each tier would supersede the marginal potential of having one person oversee my kids’ K-12 education. Furthermore, I’m not sure how equity and access will be increased by this new realignment. The current Executive Officers are very familiar with their schools and are quite accessible to parents. At Tusculum Elementary School, where my children attend, Executive Officer for Elementary Schools Vanessa Garcia, has assisted me quite competently a number of times over the years, and I’ve heard similar stories about Aimee Wyatt, Executive Officer of High Schools, and Antoinette Williams, the Executive Officer of Middle Schools. All three of these individuals have a wealth of knowledge in regards to the history of the district as well as their tier. It also stands to reason that since they are focused on their tier, forming relationships with principals becomes easier and more natural. Under the new system, for example, if a community superintendent has extensive experience with high schools, then it only stands to reason that they will naturally align with high school principals. But will they be able to find common ground with elementary school principals as well? Middle school? This is important to consider since the ability to succeed is dependent on relationships. It’s unclear to me what great need is being addressed with this change that isn’t already being addressed with our current system. What makes this move even more baffling is that back in November Joseph recognized the challenges our middle schools specifically face. He told NPR, “Now is the time to give middle schools the love and attention they need to help strengthen our high school programs,” Hmmm….exactly how is moving to a k-12 model going to strengthen our middle schools? Is every one of the four community superintendents going to have extensive middle school backgrounds? I just can’t wrap my head around the reasoning. What does stick out to me is the reference to this being a model similar to one that Denver Public Schools (DPS) utilizes. And that sets off the light bulbs and the alarms for me. You see, since this past summer and the arrival of Dr. Joseph, I’ve been saying that all this is starting to feel a whole lot like the Denver model. And that’s not a good thing. Last June, when I attended the National Charter School Convention, I attended a workshop on Achievement School Districts. At the top of the list for supposed success stories was Denver Public Schools. DPS employs what is currently known as a portfolio model that was created through the Denver Plan. Under a portfolio model, you have students who are zoned to what they call “boundary schools,” but everybody gets a choice of what school to attend. The “boundary school” is in essence your “zoned school,” and you are welcome to attend that school if you so desire, but you do have the opportunity to choose a different school. The good news here is that there is a unified school choice enrollment form. This means that everybody – charters, magnets, and traditional schools – all enroll at the same time, unlike here in Nashville where some charter schools have independent enrollment periods and forms. In fact, some charter schools here in Nashville are sending out marketing brochures all year long advertising space in their schools. The flip side of that is that since all schools in a portfolio district are competing against each other all the time, every school decision becomes part of the marketing plan. Now here’s where things get tricky. As part of its push to increase school choice, because DPS loves some school choice, they have created “enrollment zones.” If you live with in an enrollment zone, you are guaranteed a seat at one of the schools within that zone but not necessarily the one closest to you. In theory, this should make parents more involved in the choice process and diversify the schools. The reason being that you are offering a narrow choice that is easier to navigate and allowing parents to discuss their choices with other parents within the enrollment zone. We also need to keep in mind what factors are being used to determine whether or not a school is “failing.” Test scores aren’t a reliable determining factor in judging school performance nor should they be the sole factor used, but we use them anyway under current state and federal law. Add to that the problems with our state assessments, and we’ve got potentially big problems. So if we’re going to be judging schools on test scores – which have been repeatedly shown to link more to family income level than true student achievement – we need to take a hard look at how we are doing the judging. Schools closures are really hard on a community, and we are already engaged in an effort to increase the number of community schools. So how would those schools be affected? A few years ago MNPS saw a smaller scaled version of the Denver Plan when previous Director of Schools Dr. Jesse Register attempted to implement the East Nashville plan without parent and community input. Register was looking to turn East Nashville into an all-choice district that involved creating more charter schools. He attempted to move his plan forward without community input. Once the community got wind, they organized and pushed back. They immediately recognized the potential for increased inequities. If there are substantial differences between these two plans, I fail to see them. Sure, we are not openly discussing charter school expansion but it’s obviously a potential element. The restructuring of district supervision as Dr. Joseph has presented it would open the door to implementing the East Nashville plan wholesale. And just like it wasn’t good for East Nashville, this plan wouldn’t be good for the whole district. Let’s look closer at the charter school element in all of this. During the battle over the East Nashville plan, it was revealed that there were behind the scenes conversations taking place about charter schools. Charter school supporters saw an opportunity within the East Nashville plan to increase the number of charters in the area. Who’s to say they wouldn’t see a similar opportunity under Joseph’s plan? Play this forward to the present, and, despite Dr. Joseph’s avowed lack of love for charter schools, what’s to prevent the same talks from taking place behind the same closed doors in the future? Dr. Joseph’s change in leadership structure definitely has the potential to open the doors for future charter school growth. Admittedly, charter schools would first have to be brought in under the greater MNPS umbrella, but once that happened, it would only make sense to have strategic conversations about the role they could play in the district under the new portfolio model. Since MNPS has a vision of being the fastest improving urban district in the country, it would stand to reason that we will have to close or replace some schools. And who better to fill the void than the charter consortium? Not to mention that the brand new Tennessee State Charter School District gives incentive to include charter schools in any strategic plan. This is why I get so frustrated with the continual battles with the same old cast of characters. Our focus should be first and foremost on improving all schools and making them equitable. Secondly, we should be having conversations about the potential long-term ramifications of shifting policy and how do we truly implement best practices. These conversations need to take place in a transparent manner with all stakeholders, something that is not currently happening right now. If you need evidence, all you need to do is look at a recent Dad Gone Wild poll where 42% of repondents said that their biggest challenge this year was a lack of clear instruction on district iniatives. That’s the proverbial writing on the wall. In Nashville, we talk a great deal about equity. Lets take a look again at Denver and how their organization has affected equity. In 2016, they had 24 schools that earned the lowest possible score on a district measure meant to gauge how well schools are educating traditionally under-served students. I would say that’s substantial. Furthermore, DPS has a color-coded rating system for schools, with blue being the highest, followed by green, yellow, orange, and red being the lowest. Of the 82 DPS schools that were blue or green overall this year, 33 were below green on equity, with the majority of the 33 being yellow. This is more than a little troubling in a system that is supposed to increase equity. Denver has seen some improvements under their strategic plan, but it hasn’t been all rosy either. Parents and teachers often complain about not being included in decisions, and the achievement gap is also proving difficult to change. The Denver school board has been accused of inviting “the community to look at plans already being put into place.” Overall, the best that can be said is that the grades have been mixed. I don’t want anybody to mistake my writing here as outright opposition to Dr. Joseph’s sort-of-revealed plan. It may be the direction we need to go in and admittedly the majority of what I’ve written here is hypothetical. I could be miles off base. But I would argue that there is enough evidence to warrant having a public conversation about it. What I am opposed to is the implementation of any large scale change without stakeholder engagement and input or without fully revealing the plan. This plan will have huge implications for years to come. If it fails, Dr. Joseph and his team will get to just head back north while our teachers, administrators, parents, and children are left to navigate the wreckage. Want to know what that looks like? Just ask the residents of Seaford, Delaware. Seaford is where Dr. Joseph’s had his only other stint as Director of Schools. It’s a much smaller district than MNPS, but he implemented similar changes there. He introduced a brand new strategic plan with familiar elements. The plan came with a 1.5 million dollar tax increase. Voters rejected the increase, but it didn’t matter because Joseph had already moved on. Ironically, his last official day was the day after the vote. His replacement was left to clean up in the aftermath. No offense to Dr. Joseph or his team, but they really have no track record on a policy implementation of this magnitude, and are we really in a position to potentially allow history to repeat itself? It’s like handing a stranger outside of a casino a million dollars and telling them to bet at will. There is an old saying that should hold true here: “He who pays, gets a say.” Despite the mayor announcing no new tax rate increases, Nashville residents will potentially see a large increase in what they pay. I would argue that it’s imperative that stakeholders get a say before we move forward. This is where you national readers need to take note. Privatization forces have been looking to replicate New Orleans and it’s all charter district for years. (Now I know this isn’t all charter school folks and if its not you, just ignore and move on.) 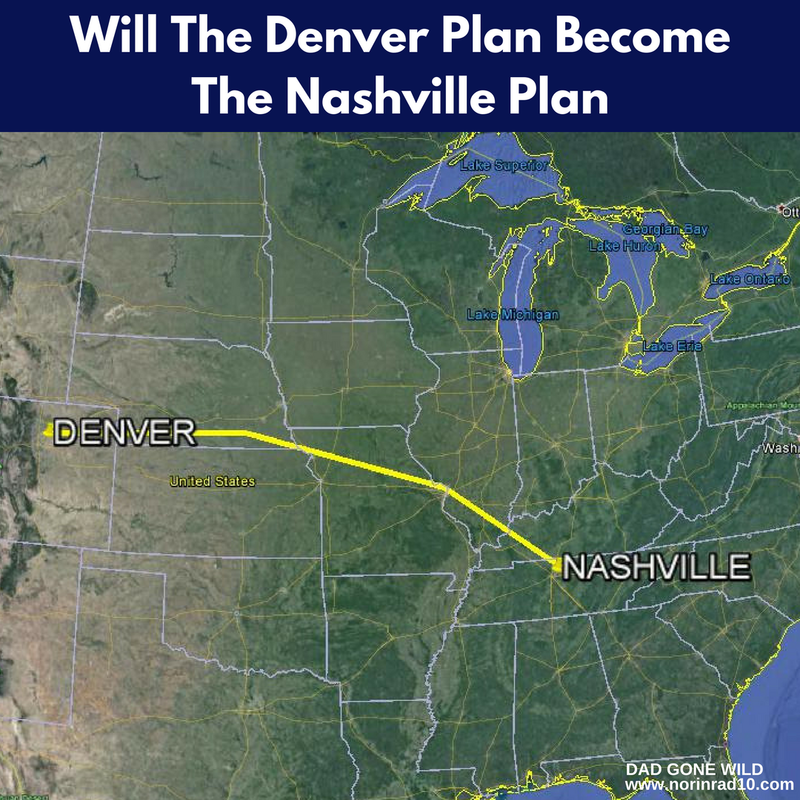 The Denver model represents the best opportunity for that goal. It’s a kinder, gentler, less obvious model and therefore provides unique challenges. We need to be ready to recognize and face those challenges. The privatization conversations of today aren’t going to look like the conversations of the past. If we cling to the old conversations and don’t recognize the new ones, then we’ll be playing catch up once again and those who will pay the price will be our schools, teachers, families and ultimately our communities. I wholeheartedly agree with the need for more input from teachers and parents, as well as more transparency from Dr. Joseph about this plan. But it seems these concerns, like all the concerns that people have brought forward, will probably continue to fall on deaf ears. I wish the school board would wake up and start asking these questions – it’s their job to hold Dr. Joseph accountable, and I haven’t seen that happen AT ALL since he arrived. It’s been very disappointing, to say the least. Wow! Amazing research. So according to the articles you have linked to Dr. Joseph’s short tenure in Delaware, he has already tried this. Do you have any information as to what about his plan in Delaware led them to trying to raise taxes? I would think that would be a logistical nightmare with all the transportation issues that would need to be addressed. Thanks again for doing the work that our elected officials appear to not care to do. I would think if narrowed the enrollment zones down then transportation becomes more manageable. Keep in mind that our chamber of commerce has been out to Denver at least once in the last two years. The primary purpose was to study transit but they also looked at schools. The best I can tell, he had grand plans and they required funding. Still talking to folks. Thanks for the quick reply. Good to know they have already visited which makes me wonder who is making the decisions then for out new administration. Is Dr. Joseph just a puppet for The Chamber? One of many questions I wrestle with. I don’t think he’s a puppet but I’m not sure who’s applying what pressures where or even if I’m giving to much credit. I just to try to research as much as possible. Talk to as many people as possible. And lay it out there. Fellow teacher sent me tonight’s blog and I am crushed. How many more changes can our profession endure? How many more failed policies get reintroduced to the classroom, only to be pulled yet again. God how I wish we could just teach. My students need us now more than ever to stand up for their rights to an education not just to teach them how to test well. DGW, I really don’t know how much more we can take. Denver is a testing mecca. I hope we don’t follow their lead on testing. Maybe we are being too idealistic for that dream. Your administration costs will continue to bloat and there will be less money for the schools (students). The layoffs will start to come with the para’s being the first to go so that more money is available to increase administration salaries. Just wait until the “Gallop” surveys start…..that will make you want to go insane! It’s good you are looking into his DE years and keep digging into what happened in PG County. PG County is full of corruption on every social issue. And PG County is the charter school mecca of MD. Here in MD there is an odd/strange arrangement when it comes to the charter schools and the public schools and it seems to work with no one person making a profit from charter school enrollment (and I don’t know enough about why it is)…..I guess Dr. Joseph didn’t like the flavor of charter schools in MD (PGCo) because it wasn’t the money making scheme that most charter chains are known for. Nothing is ever really new. Pingback: Tennessee Education Report | Is Nashville Copying Denver? Dr. Joseph’s administration seems to have had problems providing organized and reliable bussing for students in the beginning of this year, as well as competently handling school closures and related transportation for a snow day and planning for a tornado warning during the morning commute. Why should we have confidence that he can radically restructure the school system? Only a 3% raise for employees while his friends are making almost $50,000 than previous leadership in similar positions. Just letting go Mr. & Mrs. Narcisse would save approx $500,000…..
An important point about that “Denver Plan” which gets carefully swept under the rug: Way back with George Bush’s sudden interest in pushing test-score school accountability, the problem he noted was that about 20% of America’s students were struggling and he was hell bent on finding out why. In Denver, all that has happened under NCLB and then R2T is that Denver has played the endlessly shifting school reformation game so well that they can now get away with their argument that they will have 80% of their student in what they call “good” schools….leaving that 20% poorest and most problematic completely out of their equation. Nothing has changed in Denver except long years bent to the non-stop distraction of a fund-generating “change, change, change” shell game.